Here’s a pic of the Wildfoote socks as of last night. You can just see the second sock to the left of the picture. 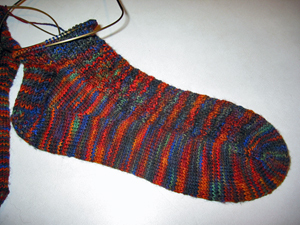 I had completed the heel flap and gusset decreases and worked up the ankle about 1 inch. Today I finished about another 6 rounds on both socks, so the ankles are 1/2″ longer or so than in the picture. It seems to be taking forever to finish these. But I keep reminding myself that when I’m done, I’m done, with no second sock still to do! It’s hard to tell from this picture, but the heel is worked in Eye of Partridge from about 6 rows before the turn through the actual turn, and then the heel flap is worked in heel stitch. The instep and ankle are in blueberry waffle stitch (2 rows of 2×2 ribbing followed by two rows of stockinette, repeat endlessly). Those are 24″ #1 Addi turbo needles (what Addi calls #1, which is 2.5mm and thus slightly larger than a standard US #1). The yarn is Wildfoote in the Brown Sugar colorway. And when these are done, the next project is a pair of socks for #1 Son. The only news from the Vatican came in the form of black smoke. Personally, I’m glad to know there’s still one place left on earth that is out of bounds for the paparazzi. I did laundry last night, and all of the socks matched up with no effort. Hangers were there waiting for everything that needed to be hung up, and I didn’t have to hunt for the one missing hanger that migrated to a different closet. Granted, I was doing laundry at oh-dark-30. But that means that it was officially Monday, and traditionally things do not go well on Monday.